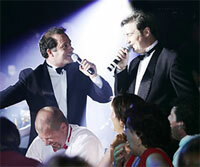 For corporate staff and business client parties, Christmas theme nights, promotions and fun. Take your pick from the different acts and make up your own schedule to suit your budget or ask us about our economical, ready made package deals. For small groups in Sydney, how about a Trivia Game Show evening? For other great Corporate Theme party ideas see here. Las Vegas theme parties can be a great way to chill out after a hard working year. Treat your staff or clients to Vegas theme night where you get to take your photo with the Vegas styled showgirls, play on real casino gaming tables with funny money, enjoy a show and then dance the night away with a great covers or Vegas themed band. Give us a call or email to check what options are available in your area. Use these actor characters and showgirl dancers to set the scene from the start of the event. They are available to hand out promotional material when the guests arrive or distribute funny money for the casino gambling tables. entertaining each group or getting their photo taken. Get your venue bar staff to mix pre-dinner cocktails and aperitifs for your guests as they arrive. The showgirls can mix and mingle handing out funny money for the gaming tables and getting their photo taken with the guests... it's always a good conversation starter! After dinner or during desert, why not be entertained by a 30 minute spot show? It's like a mini version of the shows you would see in a typical Las Vegas Casino Theatre. These are a great way to either draw the attention of your guests after they've had a chat and done some networking over dinner or to warm them up after the company speeches and prize giving. Take a look at some of these links which will take you into more detail on some of the shows. Roulette, Blackjack, Poker, Craps or a Money/Chocolate Wheel. As the tables begin, crank up the heat and the volume so those who don't want to gamble can get rocking on the dance floor. Take these examples of great dance bands or tribute acts for some superb entertainment. and we'll source an act to suit your budget.